The London Philharmonic Orchestra, one of the central institutions of the busy London concert scene, has long been recognized as one of the world's great ensembles, an assertion borne out by continued acclaim from audiences and critics alike. When the venerable Royal Philharmonic Society faced a financial crisis in the late 1920s, Sir Thomas Beecham proposed a plan to form a permanent orchestra for the first time in the Society's 115-year history. It was proposed that the ensemble, to be called the Royal Philharmonic Orchestra, would serve as the orchestra for both the BBC and the Royal Philharmonic Society. The scheme collapsed, however, when the BBC independently elected to form an orchestra of its own. In 1932 Beecham received the Society's commitment and patronage and at last founded a permanent orchestra, the London Philharmonic Orchestra. In addition to serving as the Society's official ensemble, the Philharmonic performed in other engagements as well, including Beecham's own series of concerts, the Courtauld-Sargent concerts, and, in summer, a Covent Garden opera series. Under Beecham's guidance the Philharmonic rapidly attained a high level of excellence and dominated the concert scene in London until World War II. At the outbreak of the war, Beecham departed England for the United States, leaving the Philharmonic to fend for itself. 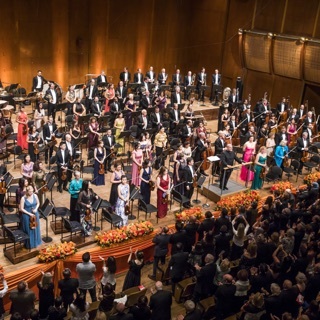 Instead of dissolving the leaderless organization, the Philharmonic's members reconstituted the ensemble as co-op and chose their own management board. When the BBC evacuated the BBC Symphony Orchestra from London during the German bombings of 1940 - 41, the Philharmonic remained, taking over the Henry Wood Promenade Concerts at Queen's Hall and maintaining without interruption the Philharmonic Society's own yearly slate of eight concerts. In 1941 Queen's Hall was destroyed by bombs, leaving the immense Royal Albert Hall as London's only concert venue; consequently, both the Proms and the Philharmonic Society concerts were transferred there. The Philharmonic continued to be the official orchestra of the Royal Philharmonic Society Concerts until 1945. Beginning in that season, the Society changed its arrangement: The Philharmonic gave only three of the eight annual concerts a year, while the remaining five were divided among the BBC Orchestra, the London Symphony, the Hallé Orchestra, and the Royal Liverpool Philharmonic. From the time of Beecham's departure, the Philharmonic demurred in naming a music director, engaging a string of guest conductors until the appointment of Eduard van Beinum as Principal Conductor in 1949. The withdrawal of the Philharmonic's government grant in 1951created grave financial difficulties that threated the ensemble's very existence; unable to pay its players on the basis of a year-round contract, the Philharmonic in 1957 resorted to booking and renumerating its players on a by-the-concert basis.